Over the last couple of years I've done posts where I have highlighted my short trades on NFLX. Don't get me wrong, I don't have some hatred for the company or the service, in fact, I think it is cool and as a late technology adopter I would love to obtain the service one day. I have an issue with companies that become over-valued and NFLX certainly has been one of those stocks. (You can insert many a high-flyer with a PE ratios that are obscene). In December of last year I was targeting $175 as an exit for a successful short. Here's a nice little update on NFLX as we see how powerfully and violently the once favored stock has fallen. I expect some bounce around $100 which is still $18 or so south of where it is trading this morning. Somehow, I think we'll see a lot more of this type of action with the broader market. Make sure you are defensive. Well, the world elite met and promised a wave of liquidity and backstops that will surely save us. US markets are up about 1% as I type this and I am left wondering how we are only up that much. Since we are not in "face-ripping" rally mode yet, I thought I would put up a sobering interview that is unlike most of the media that we consume from the Fed's favorite network, NCBC. Below is a BBC interview with Trader Alessio Rastani. He is a complete nut job or the most brilliant man in Europe. Unfortunately if you say these things in Europe you begin to be seen as an enemy of the "state". We'll need to double up or prayer efforts for him! Check out this 3 minute video, well worth the entertainment value alone. I'm not so sure I like his Treasury strategy, it seems like a brilliant guy like him could have been more creative. Perhaps he didn't want to talk his book like T. Boone Pickens, Bill Gross, Marc Faber, and the rest? You have to love the "Goldman Sachs rules the world" comment as well which makes him look even more psycho. She didn't even touch that one. Have a great week. 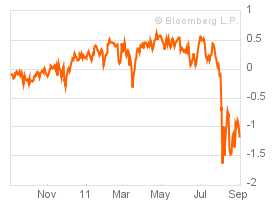 Look for the rally to 11,300 in the Dow....or a total collapse. Here is an article from the Telegraph this morning that highlights comments from mainstream investment giant Fidelity who just be came my new favorite fund company because they actually have someone on staff that will speak the truth to the public. I can only imagine what is really being said at all of these investment shops, but I'm sure they are now smart enough not to state their true feelings about market environments, stocks, and other things in email like our old friend Henry Blodgett. "Markets have reacted badly to the Fed's policy statement and European sovereign debt issues continue to rumble on. At times like these, it can be difficult for investors to know what to do. We should expect news over the next few weeks to deteriorate further. As we go into the earnings season shortly, there will be more missed forecasts and guidance from companies will be uncertain and gloomy. For investors, valuations will come in to play at some stage. Yields will be well covered because balance sheets are strong. It is clear now that the Fed cannot bail equity markets out any more and any interest rate cuts by the ECB may not have much of an impact on markets. The solution on the fiscal front will be either Greek default or Germany accepting that it has to fund debt restructuring and so reduce the quantity of debt in Greece. This will be a prototype for other European countries. At times like these, investors should remember the strong get stronger. We will see M&A pick up in Europe. There is little capital around and so the threat for companies from new competition is disappearing. Markets will have to consolidate so that oligopolies or duopolies are created and the remaining companies have strong cash flow and don’t have to rely on the debt markets. This is a carbon copy of what happened in emerging markets 15 years ago. Equity will shrink as well-financed companies grow by acquiring others and buy back their own equity. In time, this will stabilise equities. " No argument here. We seem to have a little stabilization today with a few rumors that the G20 would ensure stability and that everything would be just fine. Hopefully we get some more confidence here and we move up to my targets that I outlined yesterday in CLOSED FOREVER. Let's go back to my chart on GLD. If you desire to look back at the August 31st post where I suggested that $162.50 on GLD would be the target for a retest. http://goatmug.blogspot.com/2011/08/charts-to-watch.html. I've updated that same chart with the recent day's action and you'll see that we are right there. Personally, I am willing to take a shot here and go long, but those with bearish leanings might press their bets and hold out for a possible $153 to either cover or begin buying. I've been an advocate of physical gold for some time and one of my SOH mentors, Market Sniper, has conditioned me to know that drops in gold are opportunities for purchases as the final result of this fiat scheme will highly benefit the shiny stuff. I've called my gold guy and he sounds very depressed and I am adding a few ounces today. Those physical positions get bought and never see the light of day, so as much as I trade around GLD and SLV know that I really have two different perspectives regarding timing and purchases, plus selling physical gold and silver is a total hassle so it tends to stay in the portfolio forever. As of 9:45 CST gold is getting smacked around and SLV is getting smashed. I am buying GLD here with a short term target of $170. My stop will be $160. Be Careful cause the weekend will be full of emergency meetings for the financial heavy hitters as they attempt to save the world (again.). We were hungry and cold and we absolutely needed a warm meal. Yesterday was special, we had reservations at our favorite eatery called the FOMC Diner. Everyone had been so excited about our afternoon meal and the anticipation had simply been unbearable. As we parked and walked across the street we were startled to see a sign that rocked us to the core, we were speechless, and worst of all we had the realization that our hope for free desserts to go along with our stimulating meal would be unmet. 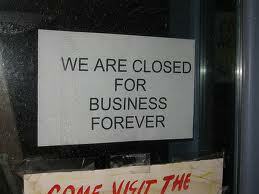 Somehow, the FOMC Diner had closed its doors......forever. The much anticipated Federal Reserve meeting decision was made yesterday and within an hour the market finally acknowledged what we've stated for almost two years; that the Fed is out of bullets. After two and a half years of getting pounded by a false market fueled by hope and trust that unlimited printed money could fix the world debt and solvency crisis, we have been been conditioned to expect the impossible from Ben Bernanke and his friends, but alas we have finally seen that he is a hollow man, simply a shell with little or no substance. Rather than assault the Chairman with paragraph after paragraph of text describing how he has misled investors and damaged the average senior citizen in favor of banks and the financial elite I will simply highlight the implications of this moment where the world awakened to the impotency of the Fed. The significant troubles we face are global and cannot be solved with easy fixes or more electronic dollars. Financial pain is going to be delivered, the question is, who will suffer and how much. When the Fed released their statement and plan yesterday they essentially told us that they would begin selling treasuries that were short dated (2 to 5 years) and they would buy in the market about $120 Billion in treasuries that were long dated (20+ years). (The total program is $400 Billion) The impact of this action will actually be that the yield curve should rise on the front end and longer term rates should fall. The Fed tells us that they are doing this in hopes of stimulating the mortgage market and reviving the housing sector. I don't buy that and in fact, I strongly believe that this action (the purchase of long dated bonds) was to meet the funding needs of the US Treasury to ensure that we can sell treasuries to someone. The Fed is essentially budgeting these purchases. Thus, the Fed and Treasury's coordination helps to fund the government and also put a cap on interest expenses for US debt. So much for an independent Fed right?! The situation could get much worse for the Treasury as well since effectively the US government has already spent all of the funds from the last budget battle and is in need of another tranche of money. I haven't discerned any new love and cooperation between the two political parties over the last couple of months and therefore anticipate that we could actually have a government shut down and perhaps more rating agency downgrades. Banks have been suffering in the last couple of weeks and that fall has accelerated over the last few days. Since banks borrow "short" and then lend "long", the impact of Operation Twist is that banks will need to pay more for their money and then they will receive less if they actually lend it out to borrowers because longer dated rates should begin to fall. This movement in rates is making the yield curve flatter, this is exactly what banks hate as they make lots of money when the curve is steep. In the last several years we have seen the Fed act in the markets with the goal of sustaining and supporting banks and financial institutions no matter how badly it would impact the overall economy or the US financial position. The key metric that makes the Fed unable to preform more QE is simply that these actions have been strongly correlated to price increases in food, energy, and other commodities (and gold). Essentially the Fed's hands are tied and Operation Twist was more about meeting government needs for interest rate control and funding than helping anyone else out. Actually if you think about the implications here, this action further damages retirees and pension funds as their investments are further crushed since most are using long dated bonds for a large portion of their portfolios and they benefit from higher longer term interest rates. Many of the metrics I report monthly have shown that our economy has been slowing down and has probably already been in recession for months. If you felt strongly that this wasn't the case, you might as well throw in the towel as the last vestige of hope was destroyed as asset prices have fallen and we'll see a failure of confidence drive the final nail in the coffin for the economy. If the Fed is right (and they are always right) then asset prices are the key to recovery AND asset prices are the key to misery and deflation. Since the maneuvers of the last two years of Fed intervention have produced no tangible lasting economic results then we must assume that the collapse of prices since May 1st will seal the deal and confirm that the US is or will be contracting significantly with no turnaround in sight. In otherwords, the asset collapse will kill the remains of the business confidence and therefore kill the potential growth that might be in the works. Remember that little area of the world that we would forget every other week when the ECB proclaims that everything is fixed or when the Fed would come out and promise they would do something next month? Oh yes, that little area. Unfortunately, Europe is still there and they still have their little issue called Greece. The Fed whiff yesterday coupled with the complete mess of the Eurozone has heightened the problems and perhaps made the dire straights the world is in more clear. While the Fed has made USD swaps available to the ECB and foreign banks, the entire area is beginning to fall apart. The Greeks need another slug of money to stay afloat for a few months and they have been forced to promise that they are really really serious about austerity this time! Unfortunately for them, the Germans are getting tired of these never-ending bail outs and are realizing that they are going to be on the hook for a larger and larger share of inevitible losses. Senior German officials are dropping out of the ECB, IMF, and Eurozone leadership and this could signal that they are making subtle moves to extract themselves from this nasty financial disaster called the Euro. In recent developments we have seen the contaigen of sovereign insolvency get a bit more serious as several major corporations have removed their excess Euro reserves from French banks and moved them directly to the ECB. As stewards of these reserves can you blame the corporate executives of these firms? No, of course not, however this "bank run" demonstrates just how fragile these banks are and how capital impaired they will be in the event of a Greek exit (default). As I suggested the other day, the ECB and IMF continue to pressure Greece into tougher and deeper cuts which have a circular and negative effect on their economy. As Greek leaders lay off government workers they harm the economy and as the economy is hurt as more businesses close and exit the nation. As businesses fail, tax revenues decrease, and more cuts are required. At some point, Greece will wake up and realize that it is better to pull the scab off at one horrible moment (default and exit the Euro) and reemerge with its own currency rather than destory everything and sell (give away) all of its assets to lenders over years. I give this 6 to 9 months more at most before Greeks take these actions. I wrote yesterday that the markets were in no man's land and that investors should wait for clarity before taking a short or long position. With one more day behind us we've witnessed a -283 point drop on the DJIA and also today's beating of -391 points to end the session at 10,733. At the cross below 11,250 we essentially got the green light to short with abandon and today's bloodbath was a confirmation of that. I would not be shocked to see some rallying as the sellers take a breather, so personally, I will add some shorts as we rally higher. Why do I have this kind of conviction despite the 750 point drop in markets? The reason is simple, show me where the catalyst is for buying? We have an impotent Fed, we have a disintegrating Euro, we have a slowing economy, we have a broken political system that argues over additional spending when we should be cutting, and we have US banks that are about to blow up again (see BAC). I'll be clear, we will probably get a pop here as we bounce off the 200 week moving average in my Weekly 4 Yr Chart, but I will be using that as an opportunity to bet on a further decline. My hope would be that we rally up to the 11,000 area, I'm just not sure we'll get there. A convincing break down through 10,700 will mean we will add to shorts with target of 9,750. If you are absolutely committed to being long the market you must look to the relative value trades we have been highlighting for several months. Those are the utilities, healthcare, consumer staples, and defense stocks. (XLU, XLV, XLP, and PPA). Even these conservative plays could be troublesome in this environment because healthcare and defense should be on the chopping block for reductions in government spending. Portfolio managers will be looking to buy dividend producing stocks like McDonald's, Coke, and others and hide out in these safer areas. They will simply look to outperform the overall index and proclaim that they "beat" the market. Personally I don't like that approach, but there are folks that feel like they must be in, and if that is you, this is where the safer water will be. ALL of those charts are resting on support. If we have another rough and negative day, all of those positions are sells in my opinion. If the downward trend continues for another few weeks we will see a coalacing of politicians that begin to find common ground to make headway and restore confidence. There will be calls to the Federal Reserve to provide stability and leadership in the wayward markets. At that moment we will see a final coordinated effort from central banks around the world to step in and halt the financial destruction with loan and debt guarantees and never-ending liquidity. Ultimately these efforts will fail, but it may provide the last boost before everything simply falls apart. This could be the point at which gold blows through $2,000 as confidence in the existing global monetary system is utterly destroyed once and for all. You need to know there is a meeting of the IMF this weekend in Washington D.C. and we could see some emergence of a plan, however I don't think this will be the "Stimulus That Ends All Stimulus" quite yet. The US markets need to endure a bit more pain to achieve the mobilization of the Treasury, Fed, the White House, and both sides of the aisle. When they are all acting in tandem, then we will see the last attempt at shoring up the collapsing ponzi scheme. Till then, this weekend may provide a small bit of fuel to give sellers higher prices to unload. Europeans are hurting and as an example the EWI (the Italian ETF) is down 50% since May, if the USA was in the same neighborhood, I would guarantee action. Let me sum this all up for you. The economy in the US is getting worse. The economies in the emerging markets are slowing down, the economies in Europe are a disaster, the banks in Europe are about to implode, US banks are under attack and Bank of America may use the nuclear option on its Countrywide purchase, and now the facade of a powerful and helpful Fed has been destroyed. If we are lucky markets will stay range bound and simply idle along, but at this point I anticipate troubling stories about Greece and Europe's banks to continue to drive markets much lower. Be careful! We should have known something was up when Timothy Geithner was making the rounds doing interviews and proclaiming that there would never be another capitalistic banking failure ever (another Lehman event). At that moment we should have simply went triple long everything as this was the signal that QE III was underway. Read the following Bloomy article regarding Fed coordination with everyone to save....well everyone. Call me a little gun shy as I didn't plow everything into longs. Unfortunately, we all should have seen the signals as big money was buying transports and they were up over 10% in two days....it's such a hard thing to keep a secret. Here is the current view of what I think could happen. First here is a chart of $SPX where it is really a nice chart. I think 1230 could be upper resistance, especially since the 50 day SMA is right there. That might take us a day or a week to get there, but if you really think about it, a week is about how much time we'll need to find out that Greece has spent through its latest allowance and is in need of another infusion of cash! This is a great pre-boost before the Sept 21st Fed meeting. This would normally be when I suggest that the Fed is going to move forward with a full court press of official QE III, but today's inflation numbers might make them pause and do a double secret QE III. The way things have gone lately make me suggest also that a push through 1230 would mean that 1260 could be the next level of resistance. Let's also not forget our old buddy GLD. As much as I hate it, the chart says this thing is going to track back to the area I've mentioned before at 162.50. Gold needs a good riot or two in Europe to resume it's parabolic ascent. I'll post a bit more later this evening. Lots of going on. Don't be confused by my sudden bullishness, we all know that the ECB and FED coordination means nothing, we are just pretending it matters and we are going to let the bots take our stocks higher. I saw a portion of a video this week and I wanted to make it available to you. Below is a Frontline PBS video about the 10 year anniversary of 9/11. As readers will recall I was an analyst and trader at the time that the towers were attacked. I did not live in New York at the time so I was not in physical danger (that we knew of), but I am quite moved still at these scenes and as humans we always tend to place ourselves in a situation and view things through the lens of "that could have been me". I know many traders and brokers in New York and Chicago that lost close fellow employees and friends and somehow they continued to work and survive. I am very patriotic and love my country, but I hate how politicians and the media have hijacked this event and am turned off every time I hear how we were attacked, but we won. No one in the US won, and I refuse to try to make myself feel better because we invaded a country full of poppies and killed thousands of men that think they are attacking us for their own good reasons. I am very emotional today as I rewatch this video and see the images of men and women throwing themselves from windows above the impact areas in the buildings. I cannot imagine the fear and utter despair that caused those actions. I don't know how I feel about this video as it shows so many men and women who are survivors of victims of 9/11. The perspective in the video is that many have lost faith in God and I would even say have a hate for Him. I cannot sit in judgement of them nor can I understand their loss and pain. I can say that I am troubled by so many of their comments and beliefs 10 years later. I have to remind myself that PBS is probably delighted to show a God-less and God-hating perspective since many very liberal perspectives agree with that. No matter what their ultimate agenda in showing the film, I want to share it. Without doing much more writing I want to state emphatically something that we all need to understand as we watch these people grapple with their faith and core beliefs about God. I continued to hear in the documentary that many of the people had perfect lives, were blessed, and felt very close to their Lord. However, now that they have suffered a loss they feel abandoned and are wrestling with how God could allow these terrible things to happen to them. I believe and know that many of their feelings of loss and God's betrayal stem from a misunderstanding of who we are and why we are here. The bible and Jewish texts tells us that we are created to worship Him and serve Him, it never promises a perfect life without sadness or loss. I hear the pain of many in the videos and they are angry and pained but suddenly attribute it all to Him. I sense that they had a deal with God that they made up, "God you give me everything I want and I'll follow you". I don't think this is the vision and the covenant that God has in mind for any of us. In fact, God says, "Give up everything and this will demonstrate your love". Giving up everything is hard and I can't begin to say that I am at that place of achieving it. I hate that these people lost so much and it pains me deeply to see that they have lost their loved ones AND their faith and confidence in the one true person of God that can heal and restore them in that place of sorrow. In that sense, perhaps evil did win that day in that it revealed the deceptions of our hearts in 9/11, that we felt that God was here to serve us and when that wasn't true we rejected Him and sought to blame Him for our wrongly formed and unmet expectations. I posted this commentary with the intent of sharing my feelings and thoughts that provoke me to tears. I do not mean to offend anyone that suffered a loss, I truly cry and share anguish with you although I cannot imagine the sorrow you must endure. With this loss though, it is imperative to have a true foundation of where we sit in relation to our Lord, without it we will be consistently disappointed and our wrong view will ultimately damage our eternal salvation. I will have to admit for the last 3.5 years I have been bearish. I recall thinking I was making the mistake of all mistakes in early December of 2007 when I moved all of my retirement assets from a "normal asset allocation" to 100% cash because bond market action and economic factors looked really poor. Despite the powerful and relentless rally where I have been forced to buy garbage stocks that had no reason to go up (along with some quality names) I felt deeply that all of the purchases were simply "trades" rather than investments because the fuel used to propel the market's launch was clearly going to run out. Friday's job figures were the cherry on top of smoke signals that have been telling us that the economy's fuel tanks have been jettisoned and we've discovered that there have been cracks in the ship's fuel containers. In other words, the report marked the beginning of the end and the beginning of all sorts of other nonsense. 14/40 EMA CROSS IS VERY TROUBLING. The 14/40 EMA is something I've used for quite a while to look at long term trends. While I would normally be jumping up and down screaming to short this market because this indicator has been so reliable for so long, one only needs to look back at the last time it happened to find a reason to pause. When was it you ask? Well of course, it was last August before we had the incarnation of QE 2! The tsunami of new mind-boggling liquidity for liquidity's sake unleashed the fury of velocity-less fiat and made asset prices soar. Now I have read some information that has said that the slope of the EMA's has a lot to do with the validity of the signal, and that is notable. In the 2010 crossover, the moving averages were not both downward sloping. In the two other previous crossovers in the last 10 years they were, and the results were devastating. I am posting a long term view of the information and you'll need to click on the image to see something a bit clearer, and this is also a weekly view of the 10 EMA / 50 EMA (sorry my system can customize these for some reason!). But the results ARE clear. A downward sloping crossover is not a good thing and has led us to the tech collapse in 2001 and the financial crisis in late 2007. IS THE QE STORM COMING AGAIN? Do I think that a QE 3 could be around the corner? Of course. The jobs report and complete slow down of the US economy and European economies is more than enough justification for more monetary fun from the boys at the Fed. The problem we may face though is that QE 3 and its future iterations are have less and less of an impact on asset prices in terms of magnitude of moves and in terms of the duration of time they are working. In essence we are getting less bang for our electronic bucks. There is no doubt that they will try and they will do whatever they can to continue to stimulus. The only problem is that the economy doesn't need more money, it needs solvency, real buyers, confidence, and truth. Additional ramps up in the Dow of 1000 points don't deliver conviction that everything is alright with Bank of America or European banks, and it certainly doesn't give a small employer confidence to hire new people when they believe that our economy is slowing again. Also, the Financial Conditions Index has confirmed that we are "all in" when it comes to recession. As you recall, any figure under zero indicates a recessionary period. So, yes, I'm as bearish as I have been and I have the economic stats to back it up and the sour mood is going to be a feedback loop over the economy that makes its prospects worse and worse. European recessionary issues are also looming there and we have a full blown banking crisis about to explode in the next month. Real estate markets in Australia are also beginning to show the stress of a blowing bubble. I've got all the reasons in the world to be as bearish as I want to be, I simply keep it in check because I know that Team Fed is meeting on September 20-21st and they'll be looking to gun the markets and make everything look better. Trouble is, they can't. I'm short a lot of things, many of which I posted the other day, however I am not short gold. As long as the European banking situation is brewing, I will continue to stay long gold as there is a real fear that the Euro may collapse and as I've noted before gold is simply the "un-currency" despite the chart that needs to revert to its mean. - CHARTS TO WATCH. No matter what the charts say, we are finally going to get an answer to who is bigger and badder? Are we going to find that the FED is so big that they can overcome the biggest bearish signal we've had in 3 and 1/2 years? Perhaps, but with all the problems in Europe they better get working cause the calendar is against them. I will post the economic calendar later, as it is important.